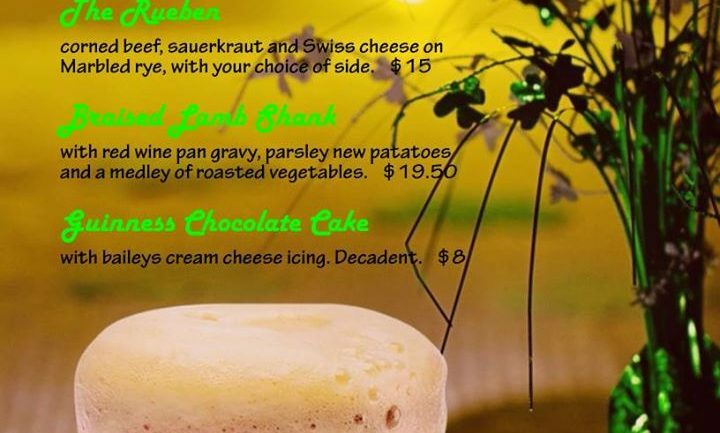 Join us on Thursday, March 16th and Friday March 17th for Chef Edward Piksiades’ inspired St. Patrick’s Day Menu! Our own special take on traditional Irish food. Of course we will also feature drink specials, party favours and a good time! Be sure to join us for our St. Patrick’s Day pre-party on the 16th featuring a Celtic Trio on tour. Schryer-Nolan-Dobres. Tickets are $20, show starts at 7:30. And remember… If Irish eyes are smiling… They’re usually up to something! !